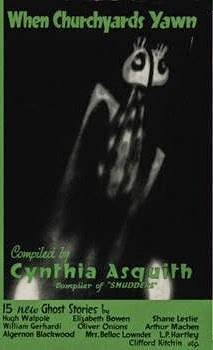 I remember, couple of posts back, blithely promising that I'd use the next But Enough About Me installment to reprint two tiny pieces I'd published about Arthur Machen some years ago. "Tomorrow," I said airily, "or some time soon." That was last October. Would have been nice, wouldn't it, if I'd got my finger out and actually managed to put the post up in 2013, the 150th anniversary of the great man's birth? Ah, well. Road to Hell, etc. Late to the party or not, why don't we take a gander at these paltry additions to the field of Machen scholarship? 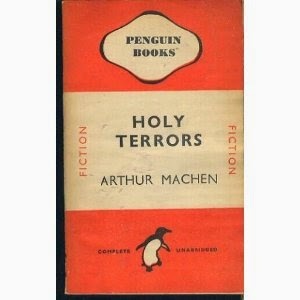 ... and then formed part of the last collection Machen saw through the presses in his lifetime, 1946's Holy Terrors, an early Penguin paperback. I lay out these useful and scholarly facts for you ahead of the reprinted essay, by the way, because they are useful and scholarly facts which -- with an impressively patrician disdain for bibliographic detail -- I had neglected to mention in the essay itself. 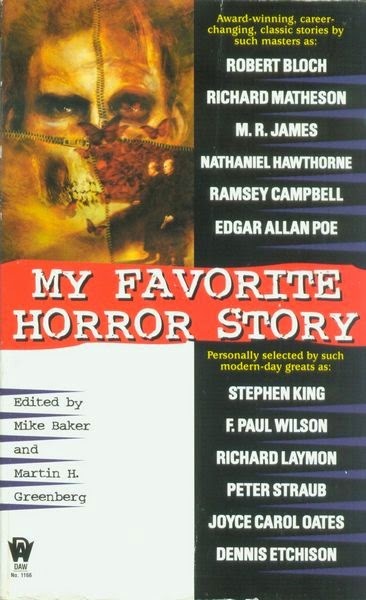 Though his reputation remains solid among the more serious practitioners and enthusiasts in the horror field, the visionary Welsh writer Arthur Machen (1863-1947) undoubtedly suffers that peculiar kind of fame in which his name is dropped more often than his books are read. This is perhaps not altogether surprising because Machen -- like the fine wines and good ales of which he was so fond -- has always been something of an acquired taste. He lived long enough to enjoy more than one brief period of voguish adulation, but for the most part he lived and worked in obscure poverty. Near the end of his eighty-four years he once did some foolish arithmetic and calculated that six decades worth of devotion to his muse had earned him approximately six hundred pounds. This is roughly equivalent to twenty dollars a year. The fact that he greeted this revelation with a mix of stoicism and amusement is a tribute to his character and seems, from all published accounts by friends and colleagues, to have been typical of a man profoundly blessed with warmth, wit, wisdom, and a healthy cynicism as regards the world and its rewards. One reason why Machen will probably always count his core audience in the hundreds rather than the hundreds of thousands is that quite frankly he's not an easy read. His prose, of course, is always beautiful, fluent, and masterly -- whether it be the Stevensonian pastiche of The Three Impostors, the hallucinogenic child-speak of "The White People", or the measured and elegant simplicity of his later tales -- but he has little patience with the undereducated. He assumes of his readership the same classical learning which he himself possessed and thus his writings abound with Latin and Greek quotations which he rarely bothers to translate or explain, and references to philosophical theorems with which the modern reader, unschooled in classical logic and renaissance theology, might be far from familiar. The other problem is that in order to experience the full Machenian magic you really need to read a lot of his stuff -- essays, autobiographies, and articles as well as the novels and stories. The effect he has on you is cumulative, and consciously so; Machen, like the medieval alchemists whom he admired and to whom he made constant metaphorical reference throughout his writings, knew that each individual experiment (or, in his case, story) was but one aspect of the Great Work, one facet only of the inexpressible mystery at the heart of the universe. Mystery -- and a reverence for it rather than a desire to solve it -- is the essential key to any understanding of Machen. His favorite Latin quotation was "Omnia Exeunt in Mysterium" (all things end in mystery) and his method in most of his storytelling is to maneuver his reader into a place where he or she feels thay have glanced tangentially at some aspect of the unknowable. The first chapter of The Great Return, his 1915 novella about the Grail, is called "A Rumour of the Marvellous" and I can think of no better nor more poetically eloquent a description of his work than that. This sense of a proximity to the transcendent is one of the things H. P. Lovecraft admired so much about Machen and one of the things he appropriated from him for his own fiction (appropriated as narrative technique at least; philosophically they couldn't have been more different -- Machen a catholic mystic and Lovecraft an agnostic rationalist). Whether the transcendence that is glimpsed is horrifying or spiritually uplifting can vary from story to story and in his best work is usually both. Like his contemporary, Algernon Blackwood, Machen's concern was to inculcate awe in his readers and it seemed to matter little to him whether that awe was achieved by terror or by wonder. He was wonderfully dismissive of occultist mumbo-jumbo -- though a member of the Order of the Golden Dawn at the same time as the notorious Aleister Crowley, he considered Crowley a buffoon at best and a dangerous charlatan at worst. The way to the Great Secret, for Machen, was not via obscurantist rituals but via a Wordsworthian communion with nature in which one can glimpse the miraculous in the everyday. In an essay entitled "With the Gods in Spring" Machen describes how on a walk with friends he saw beneath a black thornbush a single daffodil. "Forgotten then," he writes, "but remembered always; the shining apparition of the god." "Opening the Door", the story I have selected for this volume, dates from 1931. It is not, I tell you honestly, Machen's masterpiece, but it is a fine example of his art of suggestiveness, of his ability to demonstrate the interconnection of the mundane and the marvellous, and the reason I chose it is that when so little of Machen's work is currently in print it seems pointless to republish yet again "The White People" or "The Great God Pan", which are (deservedly) the most anthologized of his stories. My choice was also determined, I have to admit, by the desire to offer a small rejoinder to S. T. Joshi. 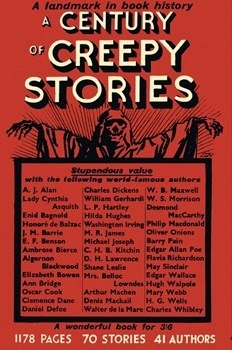 In his otherwise excellent volume, The Weird Tale (a critical study of Machen and five other classic horror writers), Mr. Joshi declares that all the Machen fiction worth reading dates from his first decade of work. This, in my opinion, is far too dismissive of Machen's later period -- a period that not only produced such tales as "N" or "Out of the Earth" or "The Exalted Omega" or, indeed, "Opening the Door", but one in which Machen's prose, always breathtakingly good, actually got better. So here is "Opening the Door". I commend it to you with the suggestion that you read it slowly. Don't look for sudden shocks or punchline endings. It offers no quick thrills, no instant frissons of horror. It will, however, leave the careful reader with a lingering sense of something beyond this world, a feeling that, however briefly, the veil that separates the natural from the supernatural (or, in Machen's phrase, the Actual from the Real) has been lifted, that a door has indeed been opened. 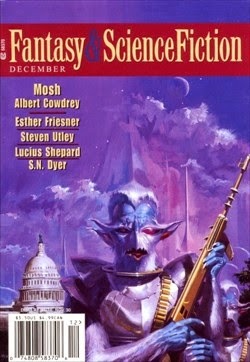 The second -- even shorter -- piece was written for the 300-words-max "Curiosities" column in Fantasy & Science Fiction and appeared in the December 2000 issue. 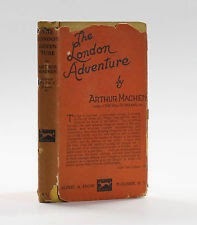 It's about one of Machen's non-fiction books, The London Adventure. Machen, the great visionary author of such classics of the fantastic as The Great God Pan, The Three Impostors, and The Hill of Dreams had told the story of his life in two earlier volumes -- Far Off Things and Things Near and Far -- and now intended to give his readers a history of his impressions of London when he first moved there at the end of the nineteenth century. Instead, referring throughout to the book he has in mind as The Great Work on London, he proceeds, with consummate good humor, to demonstrate his absolute inability to get down to it. It's a book in which form matches content perfectly; constantly sounding warning notes to fellow writers and interested readers about the perils of digression and the pitfalls of procrastination, Machen meanders entertainingly through nearly two hundred pages of interesting digressions and entertaining procrastinations. And what digressions! 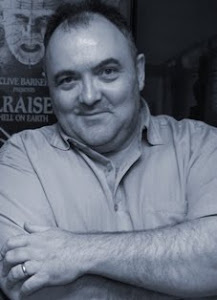 In addition to being one of the best books ever written about not writing, The London Adventure is also a proto-Fortean catalogue of curiosities and coincidence, an inventory of the inexplicable that forms a fine non-fiction companion to his fiction's obsessive love of metaphysical mystery. By the time Machen takes his leave of us, full of apologies for his failure to deliver the book he had promised and full of shame for the book he has actually written ("I had thought of calling the book The Curate's Egg but I have a distaste for boastful titles"), we feel far from cheated -- feel instead that we've read a fine book on writing, on London, and on the world and its secret life. I only discovered Machen a couple years back, I am ashamed to say. The Great God Pan, like so many that find their way there. Gave me the willies by a swimming pool on holiday - and not the sunbathing sort.